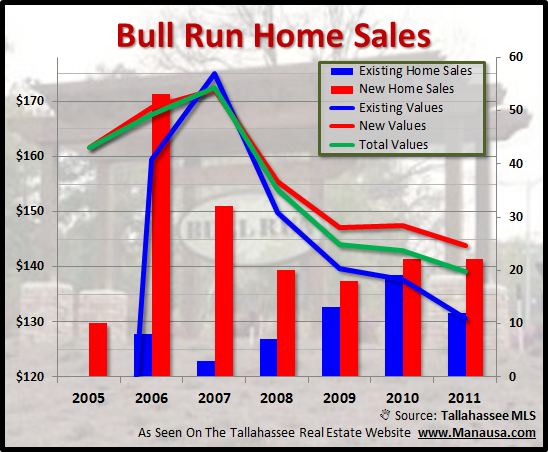 The Bull Run neighborhood in Tallahassee is still a new construction market, where 65% of homes sold there this year have just been built. This is very contrary to most of the rest of the Tallahassee housing market, where new home growth is almost non-existent. Currently, when we look at the homes for sale in Bull Run, only 5 of the 21 listed homes were built prior to 2011, which means existing home sellers are very few and far between right now. 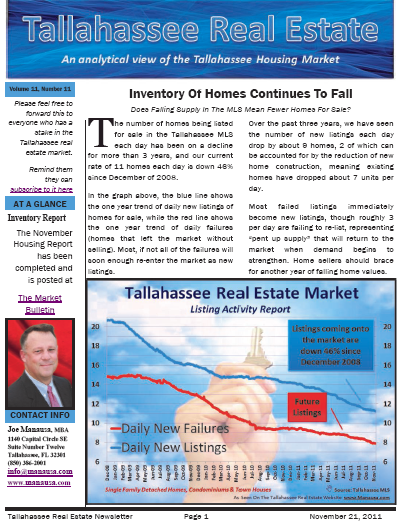 Reminder: The 44th edition of the Tallahasee Real Estate Newsletter went out to subscribers this morning. You can join the list of homebuyers, homeowners, real estate professionals and bankers who also get the top free resource for real estate in Tallahassee by clicking the newsletter image on the right. Of course, this is not a big surprise. This popular Northeast Tallahassee neighborhood only began to sell homes in 2005, and the majority of homeowners in Bull Run have only lived in their homes for less than five years, meaning that they have not yet reached the time frame in which most homeowners typically move (historically, 5 to 7 years for this demographic). 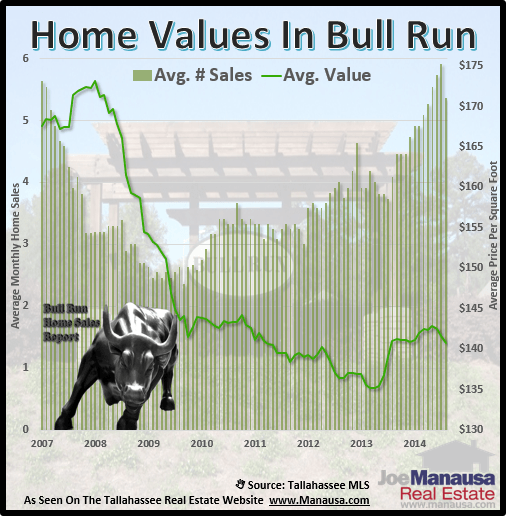 Nevertheless, home values are on the decline in Bull Run, just as they are everywhere else in Tallahassee. While sales remain relatively steady, homebuyers are getting new construction homes at prices which are 16% below what buyers paid just a few years ago. This is attracting a small, but steady growth of new people into Bull Run. The average price of a home sold in Bull Run this year has been just under $290,000, down from $299,000 in 2010 and $292,000 in 2009. This is very little price fluctuation and at face value is rare in a market that has been seeing significant declines in average home prices over the past few years. 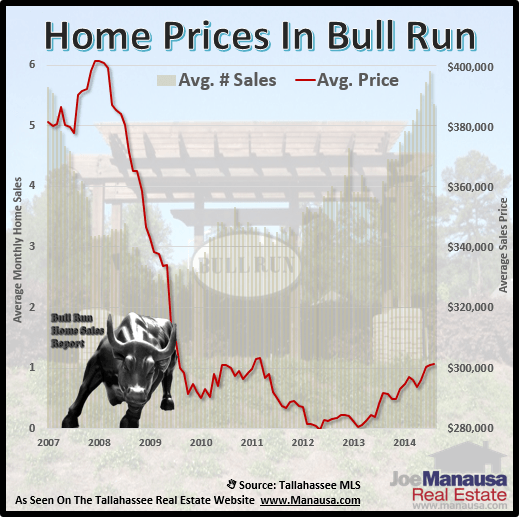 Home values have been on a steady decline in Bull Run, just as they have everywhere else in the Tallahassee real estate market. But the rate of decline (down 20% since the peak) is far better than any other neighborhood in Tallahassee that we have analyzed. We we separate new home sales from existing home sales, we find that existing home sales have depreciated at 25%, which is consistent with similar home types in the Northeast Tallahassee housing market. It is the bulk of new home sales that has created the appearance of slower depreciation in Bull Run. 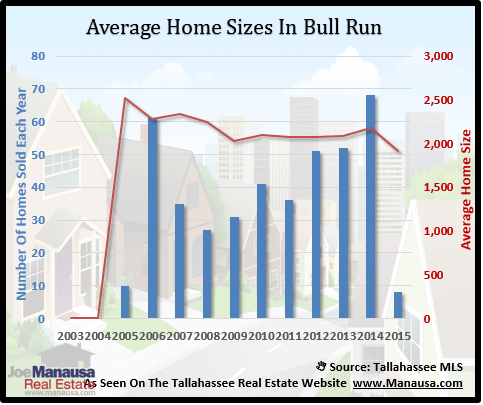 Unlike the rest of the Tallahassee housing market, where we are seeing larger home sizes while prices drop, Bull Run is seeing smaller home sizes while prices drop. This is a sign that homebuyers are willing to pay a premium for new construction in this popular Northeast neighborhood right now, and hopefully when the sell cycle hits in Bull Run, they will be able to weather the storm until all the resales wash through the market. Homeowners in Bull Run can expect to see a continued stream of new homes being built in order to liquidate the abundance of developed lots. As prices and values continue to decline, this means that land values will be (and currently are) falling fast. It will take many years to work through the available lots, so homeowners will face stiff competition against new home sales for many more years to come. If you own a home in Bull Run and want to explore your options, just drop me a note and we can meet and review your current value and opportunities you might not yet have considered.